During the early 90’s Jet Li wasn’t having a lot of box office success. He had a series of films that bombed during this time period, and he sorely needed a hit film. Enter Yuen Woo Ping and Gordon Chan, with a plan to remake one of Bruce Lee’s signature films. Could they help Jet regain his mojo? The film starts at Kyoto University, Japan, as Chen Zhen (Li) studies engineering. A group of Black Lotus clan students arrive to throw Chen Zhen out because he’s Chinese. Things are cool until they threaten to hurt Mariko, his girlfriend, and a scene of asswhooping ensues, as Chen calmly takes them all out. Woo Ping gives his signature first fight here, making it a small taste of what’s to come. There is a lot of great grappling here. 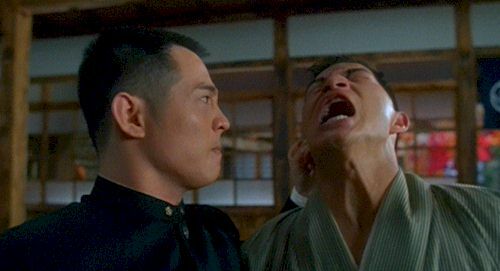 Mariko’s uncle Fumio Fukushima (Kurata) arrives to stop the fighting and inform Chen Zhen that his master, Hou Yuan-Jia was killed in a match with a Japanese master. (This is the same Hou Yuan-Jia character Jet would play years later in Fearless, I believe.) Chen Zhen returns home and immediately goes to challenge the Japanese master Riuichi to a battle, but not before he fights his students in a scene that recreates the famous Bruce Lee fight between the Japanese students. 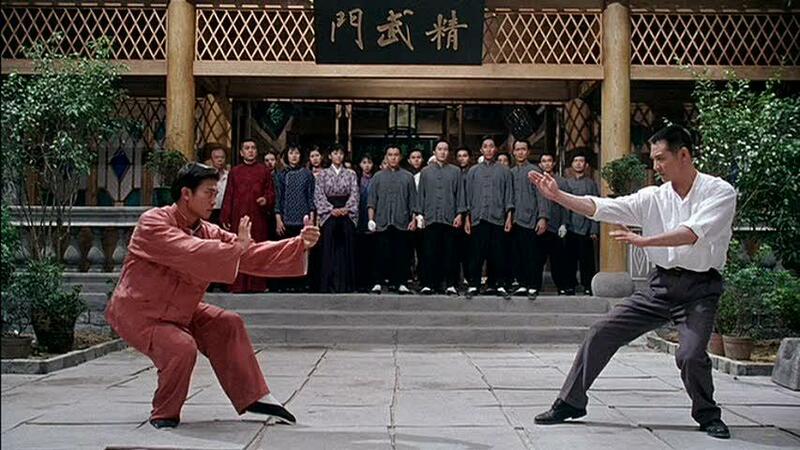 The fights here are fantastic, and shows the audience that this is Jet Li’s version of Chen Zhen, not Bruce Lee’s. After he defeats Riuichi Chen returns to deal with the impending drama at home as he finds himself in a power play he doesn’t want with his best friend and kung fu brother Ting’en, son of Hou Yuen-Jia. Meanwhile Riuichi blames General Fujita (Chow) for poisoning Hou thus robbing the match of any honor, and the General kills him and lays the blame on Chen Zhen, prompting his arrest. In court Chen Zhen is released due to the testimony of Mariko, which saves Chen Zhen but complicates matters greatly as Chen Zhen is now ostracized by both the Japanese and his own people for loving a Japanese woman. Chen will also face Fumio Fukushima himself in a duel before joining his friend Ting’en for the final fight against Fujita. Fist of Legend is a great film all on its own, remake or not. 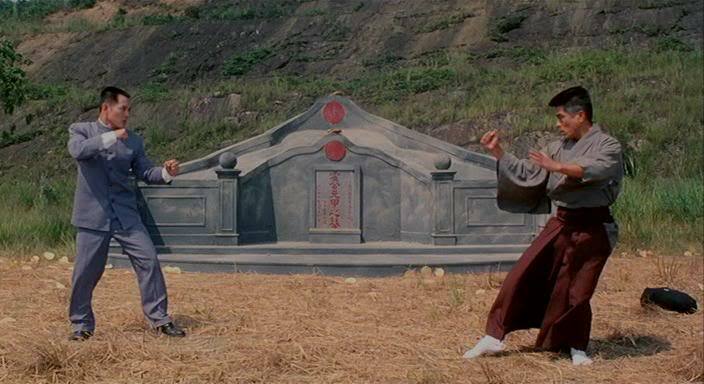 Yuen Woo Ping once again brings his “A” game to all of the fights. The fight between Chen Zhen and Ting’en is great, showing the difference of styles between them, and the final fight with Fujita is also well done as Billy Chow gives Jet Li all he can handle, but without a doubt the best fight in the entire film is between Jet Li and Yasuaki Kurata. Woo Ping saves his best for them, and they don’t disappoint. 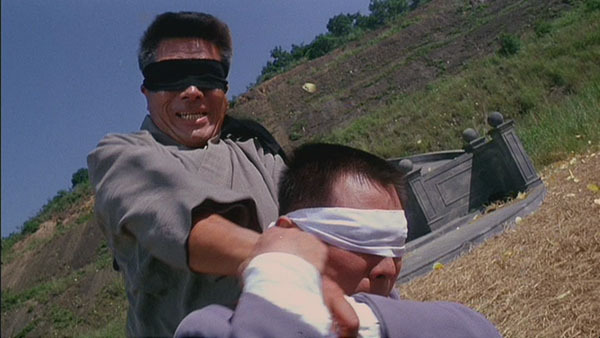 The fight goes from traditional to way cool as both men don blindfolds for the second half of their fight, taking Woo Ping’s choreography to new heights but keeps the wire work to a minimum, and director Gordon Chan makes sure the camera work and editing is spot on. Yeah, this fight is easily one of the best onscreen fights in either Jet’s or Kurata’s careers, and that’s saying a lot. 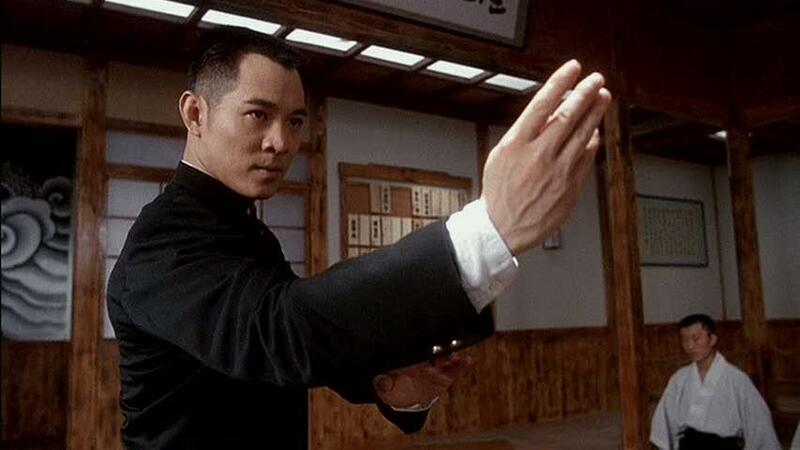 Jet Li takes the Chen Zhen character and makes it his own, bringing a calm intensity to the character, and Billy Chow plays a great evil General, but he is a much more dynamic fighter than what this film shows, but that’s the character he plays. The acting is pretty good in this film, and Gordon Chan moves the film at a brisk pace, so there are few slow spots. While Fist of Legend is a remake, it is an excellent remake that tells a better, more layered story than the previous film, with, dare I say it, better fights than in Bruce Lee’s version, which is no small feat, but good things seem to happen when Yuen Woo Ping is teamed up with great talent, and that’s on full display here. It was this film that gave the Wachowski Brothers the ideas for the fighting styles and wire scenes they wanted for The Matrix. CHOREOGRAPHY: (10) Some of Yuen Woo Ping’s best work that will be copied in lesser films for years to come. Everyone does a fantastic job, but Kurata and Li’s fight is the highlight. STUNTWORK: (8) Not a lot of crazy stunts, but the stuntmen perform admirably in every fight scene. STAR POWER: (10) Li, Kurata, Chow, and Woo Ping, some of the biggest and best performers in the martial arts film world in the same film. Jet Li’s career soared to new heights here, and began to cement Jet beside Bruce and Jackie as one of the best martial arts stars ever. FINAL GRADE: (10) This is a great film that is better than the original in many ways. Jet has some of his best fights here, and Yasuaki Kurata is gold in whatever he’s in. Great review. This is an excellent movie. I agree – the fight between little Jetski and Kurata Yasuaki is a definite highlight and, I think, one of my favourite fights of all time.